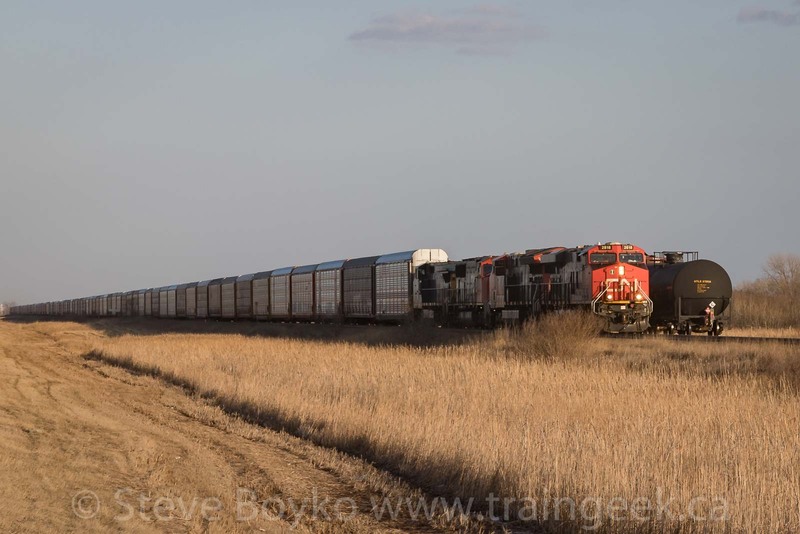 I ducked out briefly on April 18 to photograph trains over by Symington Yard. There wasn't a lot going on beyond the regular hump yard activity. 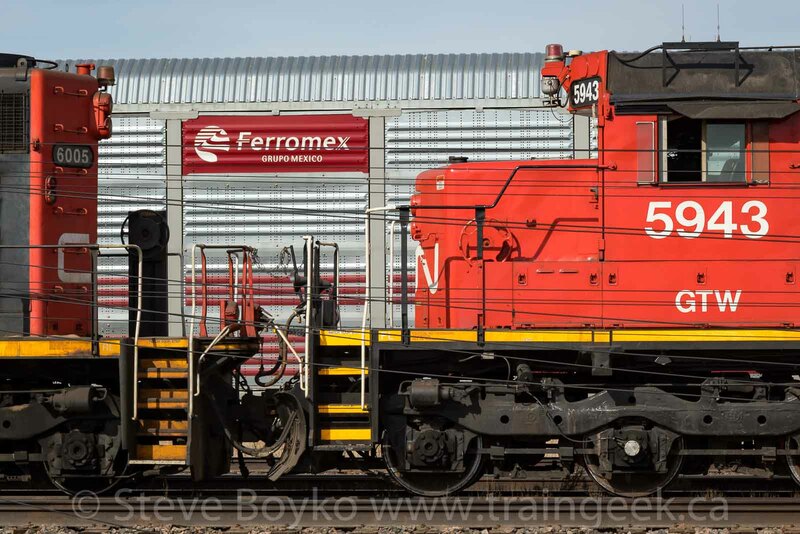 An SD40-2 rich set of power was on one pullback track, with CN 6015, GTW 5943, CN 6005 and slug CN 217 hard at work. On the other track, CN 6016 emerged from behind CN 6015 as they pulled a long string of cars back from the yard. This set was 6016-6010-GTW 5948-255. I like the grey GTW units better than the black-red-white units. The freight cars were pretty unremarkable, except for this pinkish three bay hopper car - reporting mark CC. I noted one end was painted white, so maybe it is equipped with a rotary coupler for dumping? A carbon copy / CC? A train was getting ready to depart the yard, but I didn't have time to stick around to chase it. Sisters CN 8903 and 8960 were on the head end. So that was April 18. Thursday, April 19thI went out along the CN Sprague subdivision on the evening of the 19th to see what I could see. 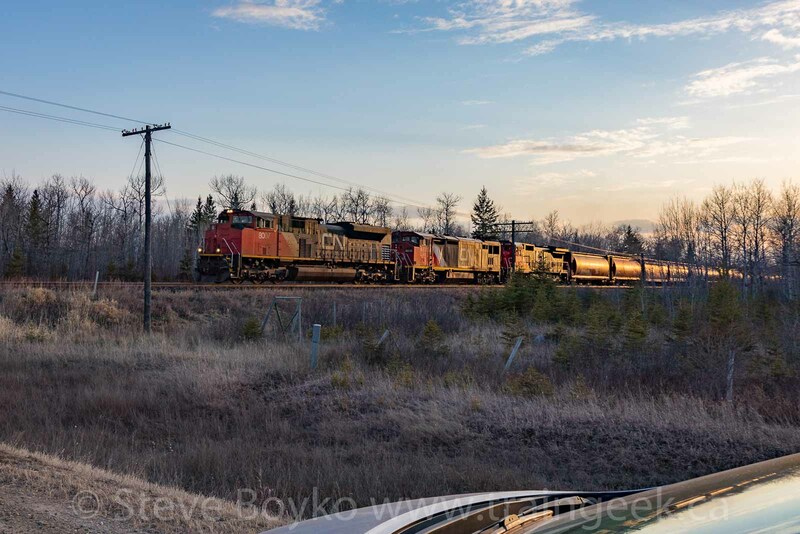 As I approached Symington Yard, I saw an eastbound freight was getting ready to leave, so I headed east along the Trans-Canada Highway and set up on the "sun" side to capture the train. I decided to shoot a "going away" photo to take full advantage of the sun behind me. I believe this is the approach signal for the Lorette siding. 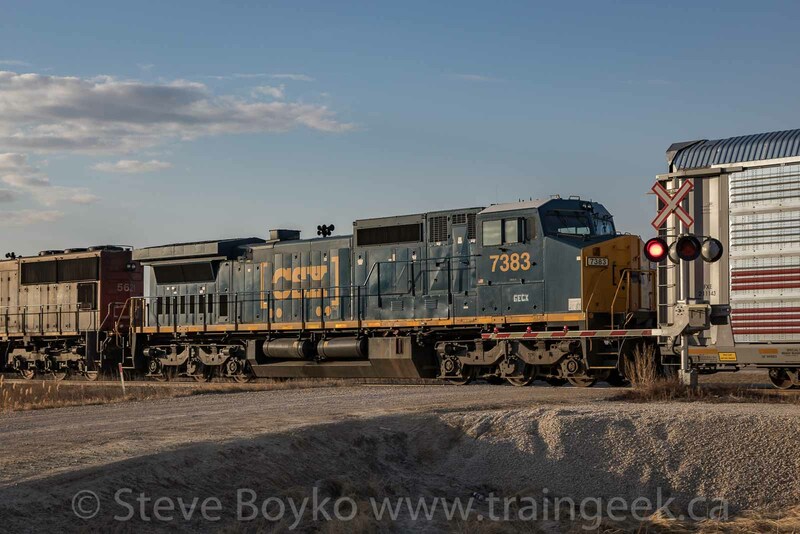 It was showing yellow over yellow, and CN 2323 would end up taking the siding, as you will see. There was a DPU locomotive, CN 8878, about 2/3 of the way back in the train. 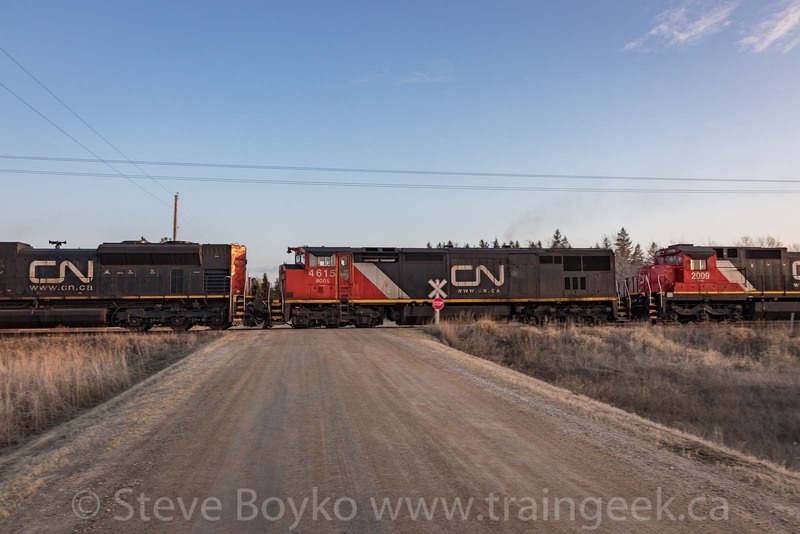 CN has been running a lot of trains in this "1+1" configuration, one locomotive on the head end and one in the middle of the train. Notice my shadow and my old Canon T1i on the tripod, taking video. I liked this Saskatchewan car - now lettered for MGLX - Mobil Grain. 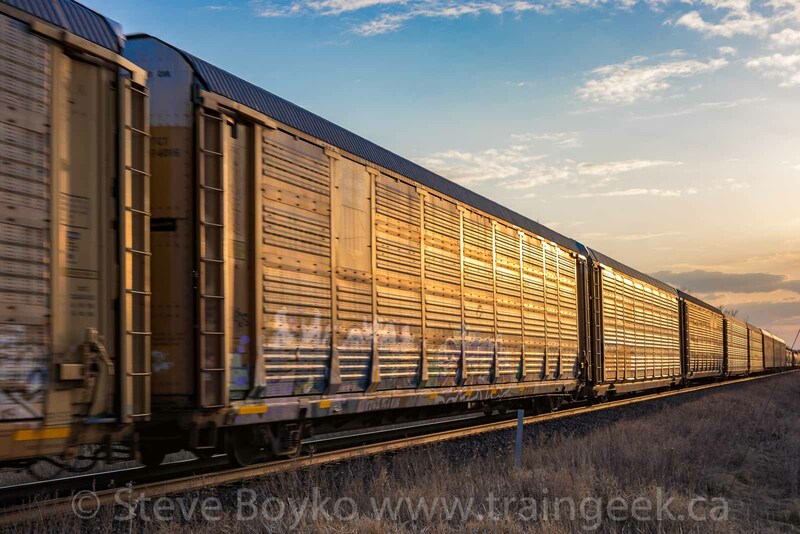 663 hopper cars were purchased by Big Sky Rail, at a price of about $10K / car. The Saskatchewan Grain Car Corporation sold off its fleet last summer. The Great Western Railway bought 150 and the Great Sandhills Railway bought 85. 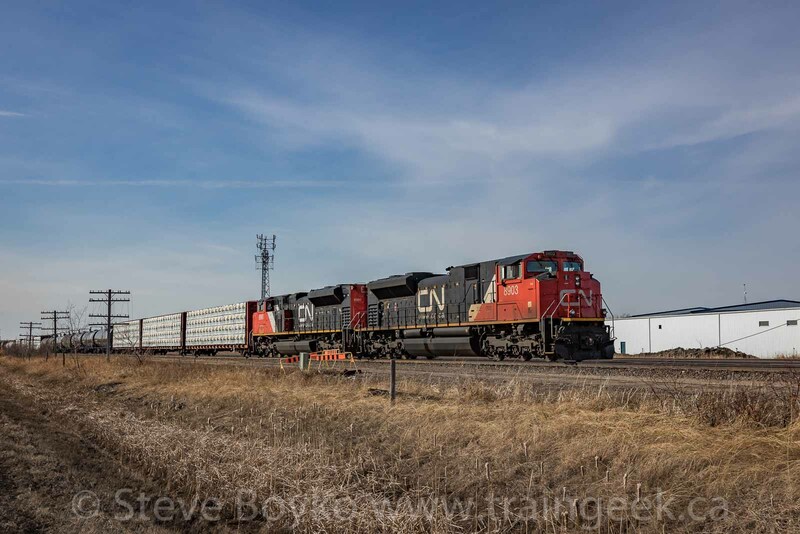 CN 2323 East trundled into the siding at Lorette, meeting the waiting autorack train led by CN 2818. CN 2818 West had four locomotives, including a lease unit. I repositioned to the sun side of the train to record the train leaving. I didn't have a lot of time and I wish I had 30 more seconds to set up for the video. Oh well! The train had CN 2818 / CN 3019 / CN 5621 / GECX 7383 for power. Here's a view of GECX 7383. I decided to let them go without a chase, so I went up to the CN Redditt subdivision. I went to the first crossing east of the highway and saw the tail end of a train heading east. Time to chase! It turned out to be a long chase. I had to drive through Dugald and beyond before I caught up to the tail end. I continued on through Anola before I saw the head end of the train. After another few kilometres, I figured I was far enough ahead to cut right into a side road to get to a crossing to nab the head end. 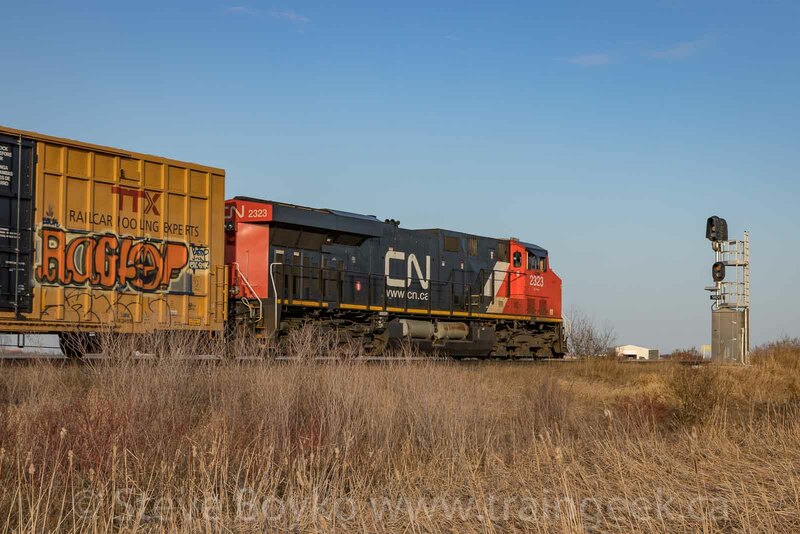 As it was, I barely had time to put the car in park and jump out to get the shot of CN 8007 East. BCOL 4615 was second in line, with CN 2009 third. I took a few shots of the train with the setting sun glinting off the side. I liked this one the best. 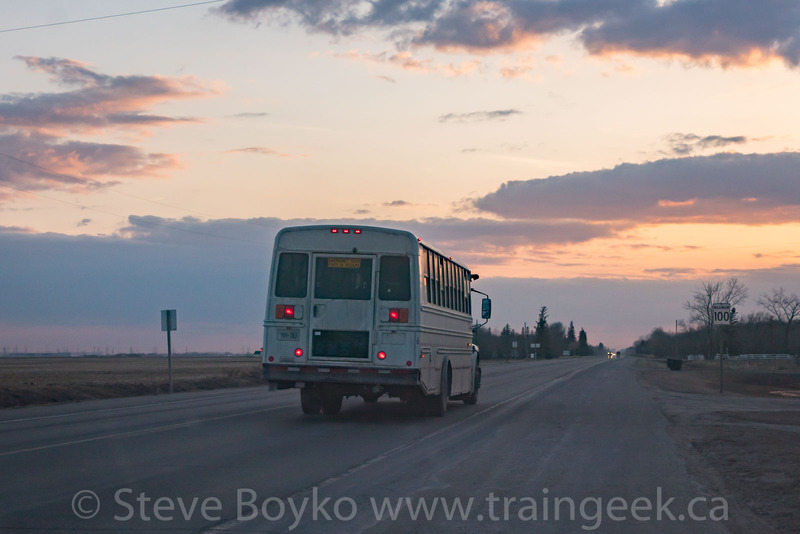 I continued into Winnipeg, making my way down Plessis Road past Symington Yard. I noted that CN 2818 West was stopped just short of the Fermor Avenue overpass. That was the end of the railfan day for me, and this marks the end of this series. Thanks for reading these "four" days in April, which ended up being five. Call it a bonus day!